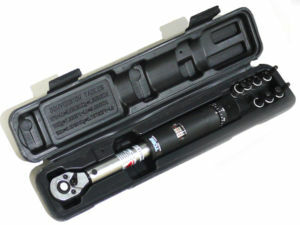 A torque wrench is an important tool for the manufacturer and the mechanics. Whether you are repairing a car, motorcycle, bicycle or any other thing you definitely require to fasten the screws and nuts. It is not always a matter of fastening screws and nut but specifying if they should be tight or not since not all are tightened. Some are left loose while others should be tightened for the purpose of a perfect running of the machinery. Use of the wrong tools for other purposes does not always work. It at times leave a glitch or even worse which means that the one has to redo the task once again. It is very frustrating that after putting too much of your effort, time and full concentration in performing a repair thinking that at the end you will have dealt with it once and for all but you end up having to repeat the whole process once again. In most of the cases, this is usually brought about by under-tightening or over-tightening of nuts and bolts which will then cause breakages or damages in the parts we are repairing. The problem does not have to face you anyway if you use the right tools for the right purposes. Stop using the pliers to fasten nuts while there is a tool which is perfectly made for the purpose as a torque wrench is a tool made purposefully for this activity. It is a tool made and developed for the purpose of fastening nuts in a given torque which makes that accuracy is considered. Whether one is such a professional and has a lot of experience, a problem of accuracy affects them when it comes to nuts and due to this reason, a torque wrench becomes necessary. How to choose a good torque wrench. It is good to consider the efficiency of a torque wrench. The purpose of a torque wrench is to fasten the nuts in the best way as required and for this reason, the torque wrench should be accurate in order to meet the set torque. A torque wrench which works best is known to have an at most inaccuracy of 5%. Any other inaccuracy is considered not advisable. It is also to note the maximum torque that the torque wrench can measure. This is because some nuts need to be tightened which calls for a lot of torque meaning the bigger the torque the better. Considering the durability is also a factor of concern. Durability means quality hence a high-quality tool means that it will be durable. A repair tool should be quality and durable since it should be able to deliver quality services and also be used for a long time. Importance of a torque wrench. A torque wrench is a very important tool. It helps give quality service. Fastening of nuts and screws requires specified torque which it is more than difficult to achieve through bare hands. A torque wrench helps to accurately measure a given torque accurately. Using bare hands to fasten the nuts is so tiresome and time taking but when you use a torque wrench it means that you get to do it faster with less energy. This guarantees you that you can fasten as many screws and nuts as possible.